A dental filling is a restoration used to repair minor to moderate tooth damage. Lord Dufferin Dental Centre is a progressive and high-tech Orangeville dental centre located on First St.
Our dental practice welcomes all existing patients and is currently accepting new patients. As top-rated dentists in Orangeville, and with many of our patients telling us the best dentists in Orangeville, we take pride in offering a personalized, comfortable and caring dental experience for your entire family. 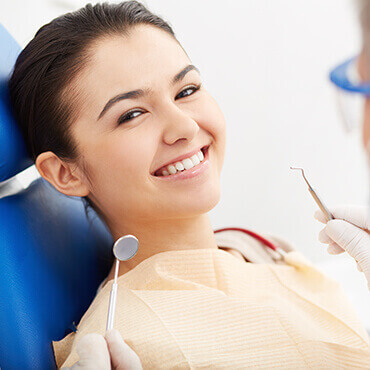 If you are looking for an Orangeville dental centre that is passionate about dentistry and cares about their patients, we welcome you to contact us to arrange an appointment. Providing comprehensive family dentistry and cosmetic dentistry in Orangeville, our goal is to keep your smile looking and feeling great, while providing the best dentistry and oral healthcare available. At this Orangeville dental centre, our goal is to ensure your dental needs are always met while providing a safe and relaxing environment. We understand the importance of making our patients feel welcome and relaxed. Visit our service pages to learn more, or simply call us to see if we can help. Whatever your dental needs may be, our team will go above and beyond to ensure tat your smile looks and feels amazing. We look forward to seeing your beautiful smiles soon! Lord Dufferin Dental Centre located in the heart of Orangeville provides free parking, convenient access, and convenient opening and closing hours. Feel free to look around our website to learn more about out dental team and services, or feel free to contact us to learn more and schedule and appointment. We are open evenings, take weekend appointments, and are accepting new patients at this time! Dental veneers are thin shells of either porcelain or composite resin that are custom made to fit over your teeth. In order to maintain good oral health we recommend that you brush and floss at least twice a day. Dental implants are titanium posts that resemble the tooth’s root. Our Orangeville Dental Centre offers 3 certified dentists, 4 specialists, and 6 registered hygienists. We welcome you to contact us today!